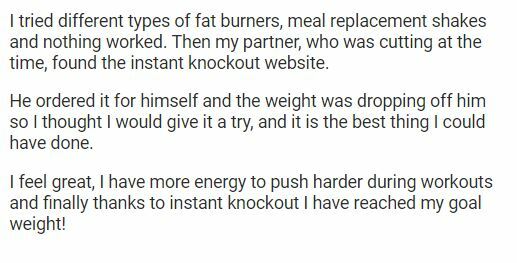 Instant Knockout was designed, made and has been endorsed by fighters, boxers and bodybuilders for use when ‘cutting’ – the process of dieting and training to melt away fat without losing muscle mass or energy. As such, it’s ideal for athletes, the above groups and anyone intent on following an intense exercise regime who wants to get trim but stay strong. 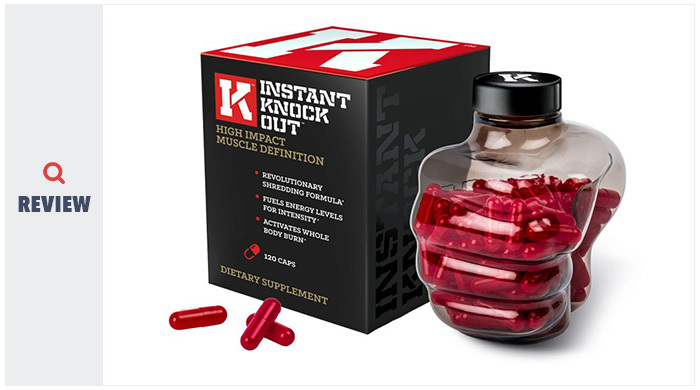 Instant Knockout uses proven scientifically-tested ingredients to create a powerhouse base stack. It then combines these with nutrients that help to boost the potency and absorbency of all ingredients, creating a ‘whole body’ fat burner. Add glucomannan to the stack – a fibre that expands in the stomach to promote satiety and control appetite – and you have a triple whammy fat burner. As its name implies, it really does pack a punch. The biggest ingredient in Instant Knockout is glucomannan (1800mg), a natural dietary fibre made from the konjac root. It swells in the stomach to make you feel fuller and prevent the desire for snacking between meals, acting as an appetite suppressant. It’s technically not a fat burner, but is a very clever addition to this stack, helping you to shred weight without feeling hungry all the time. Green tea is the second biggest ingredient (500mg) and is, we think, the best fat burning ingredient around. It stimulates the metabolism, boosts endurance and elevates norepinephrine, the fat-burning hormone. Green tea works very well in synergy with caffeine (included here is a massive 300mg of caffeine anhydrous). When the caffeine and green tea combine, it boosts the amount of catecholamines in the body, chemicals which encourage the body to burn fat for energy. The caffeine will also give a big metabolism boost, stimulating and energising you on to improved physical performance in the ring or the gym. Cayenne pepper (100mg) naturally raises your body temperature giving you a thermogenic boost, encouraging the body to burn more calories as it tries to cool down. It is also believed to reduce the amount of fat that the body stores and to help suppress appetite. In one study, it reduced calorie intake by up to 12%. Green coffee extract (100mg) is another popular fat burning ingredient. The chlorogenic acid within it helps to inhibit the enzyme glucose- 6-phosphatase, which reduces the amount of glucose made by the body. It may also slow down the rate of fat absorption from the food you eat. Other ingredients include black pepper extract (standardised to 95% piperine) which helps to boost the absorption of all ingredients, along with zinc (10mg), responsible for testosterone production and processing fat, carbohydrate and proteins to sustain energy levels. This is obviously one of the ingredients used to help maintain muscle mass and energy while dieting. Chromium is added to regulate sugar levels (thus also maintaining energy), as are vitamins B6 and B12, which also help to boost the metabolism and turn carbohydrates into glucose, making it available for the body to burn. 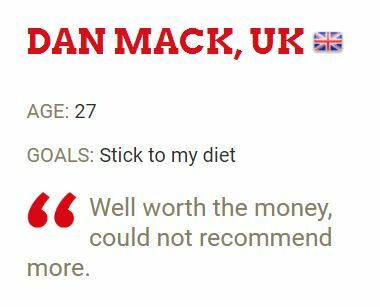 Instant Knockout gets our seal of approval for using premium versions of some of its ingredients, such as standardised black pepper extract and chromium picolinate. 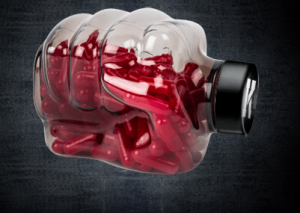 The supplement is designed by fighters for fighters and has been tested and endorsed by MMA pros. It is completely transparent with a label that lists all ingredients and dosages. No annoying proprietary blends here. The green tea, glucomannan and cayenne pepper stack makes Instant Knockout one of our favourite fat burners to date. It chooses very clever ingredients, some of which work to help fat burning in two or three different ways. It contains no banned substances and is made in an FDA approved lab. Instant Knockout offers a 90 day money back guarantee. It has a really cool bottle, shaped into a fist! The manufacturers make a point of stressing that Instant Knockout is also suitable for women. The B vitamins and zinc included here are in fairly low concentrations and in basic forms. Expect them to contribute to your daily intake, but not necessarily to offer any energising or fat burning effects. (Luckily the rest of the formula will do that for you). While green tea provides natural L-Theanine, we would have liked to see more L-Theanine added to counteract the potential side effects of such a big dosage of caffeine. 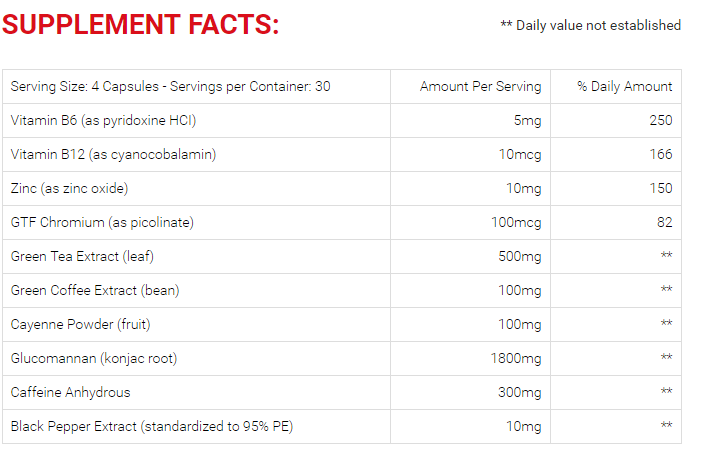 While Instant Knockout tells you to always take your capsules with water, it doesn’t stress the need for at least 8oz of it. This is needed in order for the glucomannan fibre to work to its best advantage by absorbing the water in the stomach. Most of the ingredients in Instant Knockout are well tolerated. Cayenne pepper may cause sensations of heat in the stomach and body, and some people may experience side effects such as irritability, anxiety and jitters from the 300mg caffeine. Anyone taking medication or with a medical condition should first speak to their doctor before using Instant Knockout, while pregnant or nursing women should avoid it altogether. You should not exceed four capsules a day, and shouldn’t take with any other stimulants or other products containing caffeine. Don’t forget too that you will need to drink at least 8oz of water with your capsules in order for the glucomannan to take effect. Take one capsule four times a day, first thing in the morning, before lunchtime, one in the afternoon and the final capsule before the evening meal. Oh boy, does Instant Knockout work. That’s affirmative. And so it should. It has the ingredient you need to spark thermogenesis, trigger fat burning, control appetite and blood sugar, break down fat, block carbs AND boost energy and enhance performance. 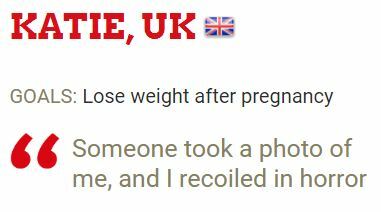 Can you see now why it’s one of our top ranked fat burners on the UK market? In order to shred weight but keep your strength and muscle mass, you don’t need a ritzy fancy fat burning supplement; you just need a science-backed, clever, no-frills product like Instant Knockout. 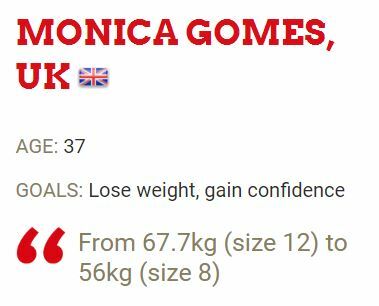 It may be designed and customised for fighters, but it will work for everyone – including women, despite the masculine-looking branding –as long as you’re prepared to train to the max. It’s a masterful fat burner with very well chosen ingredients and, despite its simplicity, it packs a powerful punch.